This is one of those DIYs that I’ve had in my head for awhile but finally got around to making it. As you may already know, I’m a horse lover and I’m always looking for equestrian inspired items whether it be something to wear (like this dress) or something for the home. So while stocking up on some things at the feed store the other day, I also picked up a few iron horseshoes. 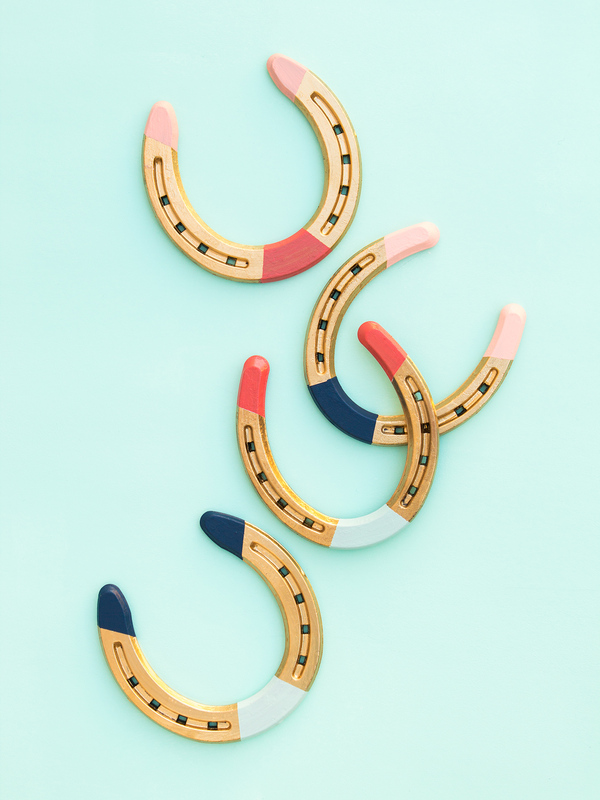 This project started by simply adding color to the unpainted iron horseshoes but I just didn’t love the results. The paint was streaky and looked a little too generic for my taste. That’s when the liquid gilding paint came it and instantly made me fall head over hoof for this one. You can package these up to give to your Valentine, horse loving bestie, or anyone that could use a little luck. They make pretty desktop paper weights and are equally stunning when hung on a wall. Watch the video below to see how to make them! 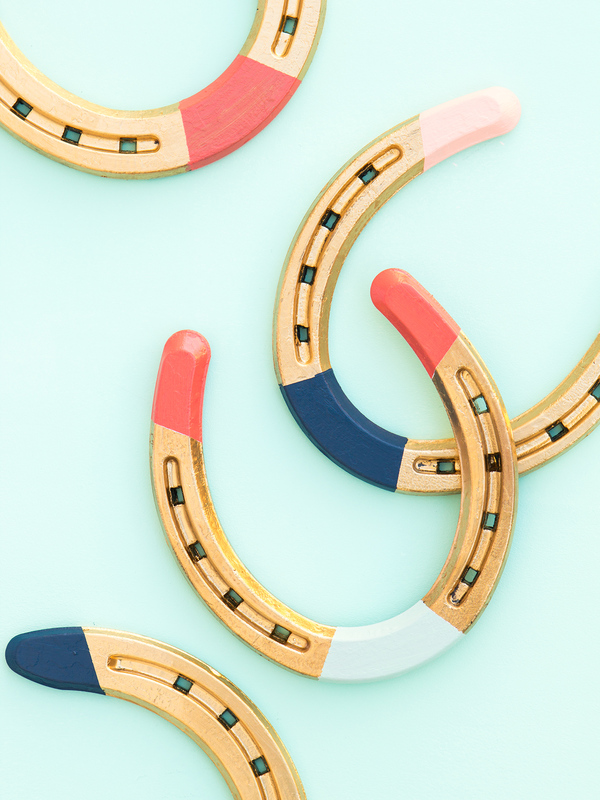 Use a foam brush to apply an even coat of liquid gilding paint all over the front and edges of a new horseshoe. Since the gilding paint is oil based, I prefer using a disposable foam brush to do this so you don’t have to mess with paint thinner. Allow it to dry completely, about 1 hour. 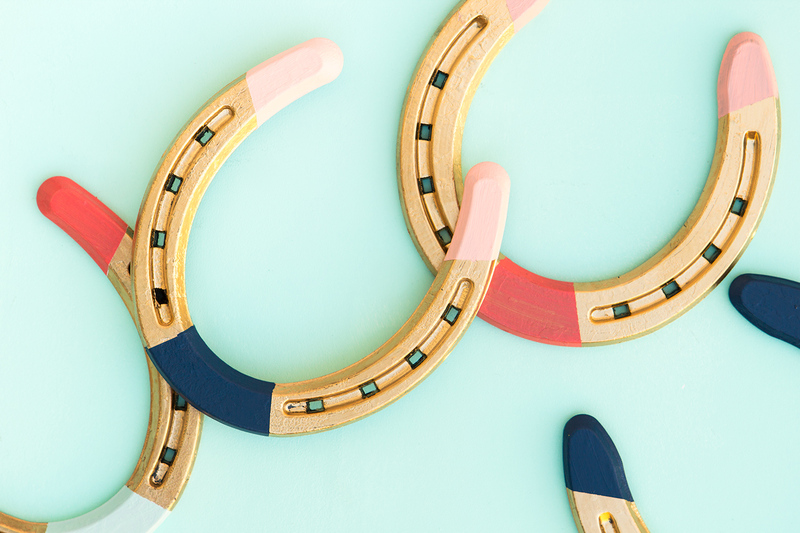 Tear off a small piece of washi tape and wrap it around the horseshoe, about an inch of the end. Do this to the other side and the middle section. Use a flat paint brush to paint a coat of white craft paint on the middle and left and right ends of the horseshoe. Be sure to paint away from the edges of the tape to prevent the paint from bleeding underneath. Allow that to dry, then paint 2-3 coats of whatever color you would like. When you are done, carefully remove the tape and allow the horseshoe to dry completely. Then grabs some nails and hang it on your wall! You can also use old, previously used horseshoes for this. I recommend using sandpaper or steel wool to remove any rust that might be on them and help smooth the surface. Love all things horses? Don’t miss my equestrian gift guide and my removable horse wallpaper. And if you own a horse, be sure to check out my easy homemade treat recipe. Thanks so much, Jess! You should definitely just go for it. The first one took me all day to shoot and edit but now they just take a few hours. My first few YouTube videos took a few days to edit because I was learning the software at the same time. Once you develop an editing style and learn some keyboard short cuts, each one will take less time. When you add the blog post component though (like shooting styled photos, editing, and social shares) it still takes about a day.